Most homes are full of these products!!! Indeed, most indoor environments (and everything in them) are now polluted with these VOCs due to the pervasive nature of these products and chemical compounds. 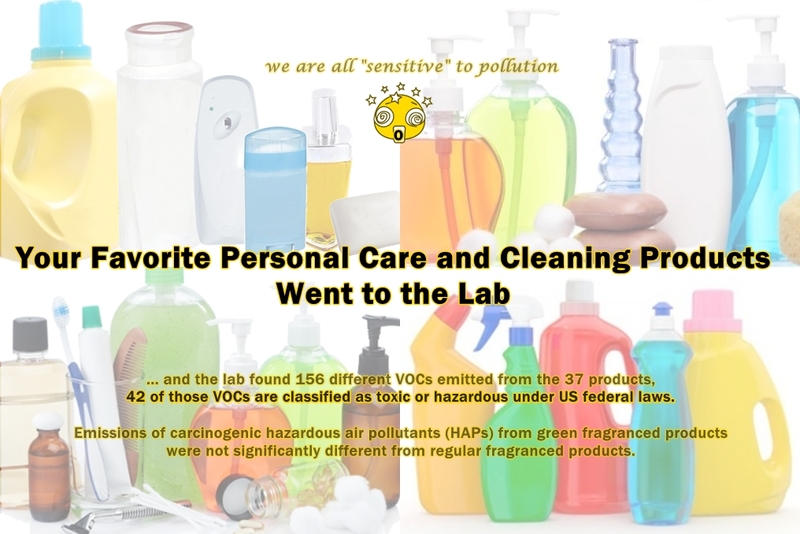 – This study investigates and compares VOCs emitted from 37 common products (air fresheners, laundry products, cleaners, and personal care products), including those with certifications and claims of green and organic (fragranced, fragrance-free, green, and regular). 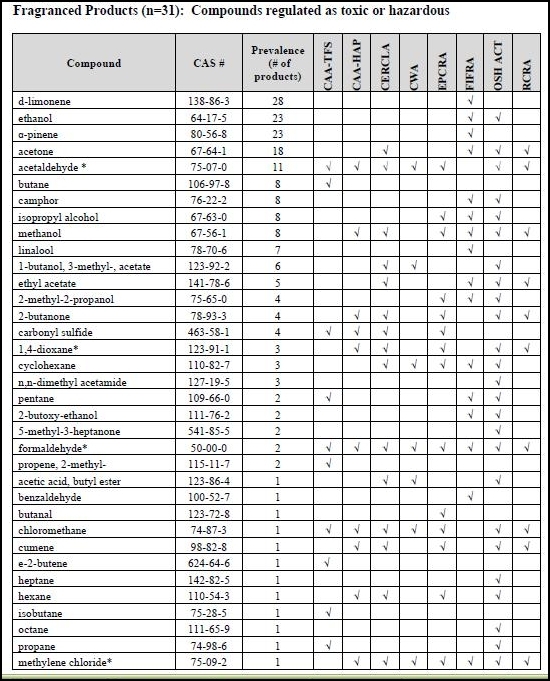 – It extends a prior study of 25 consumer products by adding 12 more products, including fragrance-free versions of fragranced products, representing the first such comparison in the scientific literature. – The most common chemicals in fragranced products were terpenes, which were not in fragrance-free versions. – Of the volatile ingredients emitted, fewer than 3% were disclosed on any product label or material safety data sheet (MSDS). Fragrance ingredients are exempt from full disclosure in any product, not only in the U.S. but also internationally. consumer products, representing 156 unique VOCs. – In fragranced products, the most prevalent VOCs were d-limonene, β-pinene, α-pinene, ethanol, and acetone, and the latter two were also found in fragrance-free products. – In fragrance-free products, the most prevalent VOCs were ethanol, acetaldehyde, methanol, and undecane, and all were also found in fragranced products. Of the 156 unique VOCs emitted from the 37 products, 42 unique VOCs are classified as toxic or hazardous under U.S. federal laws. – Each product emitted at least one of these potentially hazardous VOCs. – Among the most prevalent VOCs in the products (found in at least half of the products), 80% are classified as toxic or hazardous under U.S. federal laws: ethanol, d-limonene, α-pinene, and acetone. 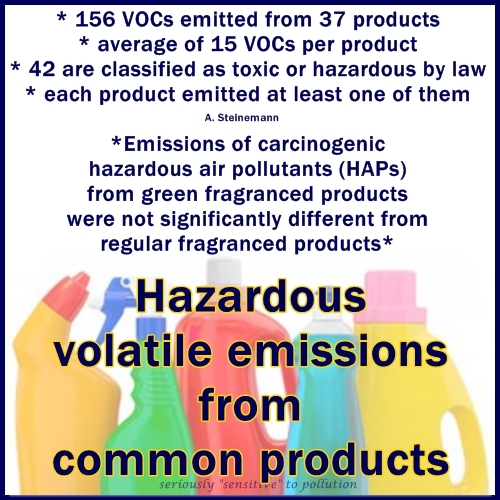 Of the most prevalent VOCs, 80% are the same between green and regular products, and of the most prevalent classified as toxic or hazardous, 75% are the same between green and regular products. 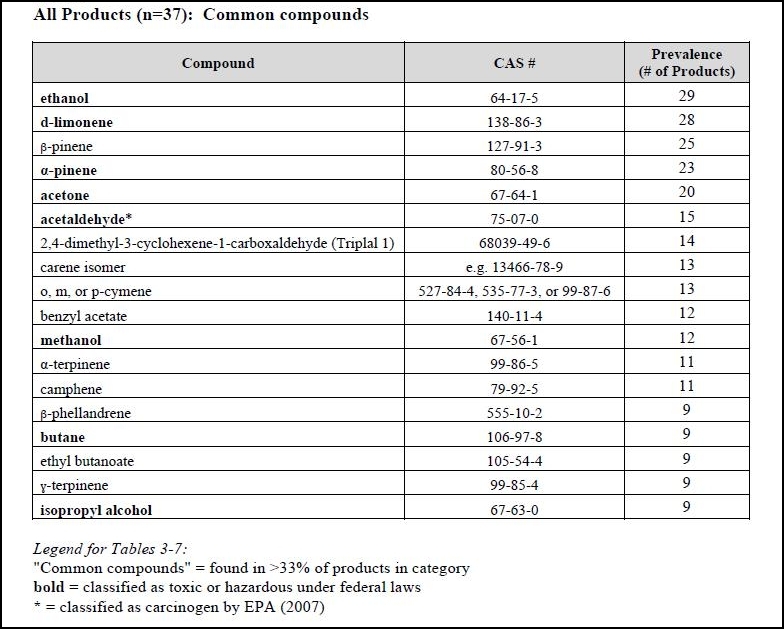 – fewer than 1% of all ingredients in the products were listed on any product label, fewer than 2% on any product MSDS, and fewer than 3% in either location. – each product appears to be in compliance with their respective laws for disclosing (or not disclosing) ingredients. 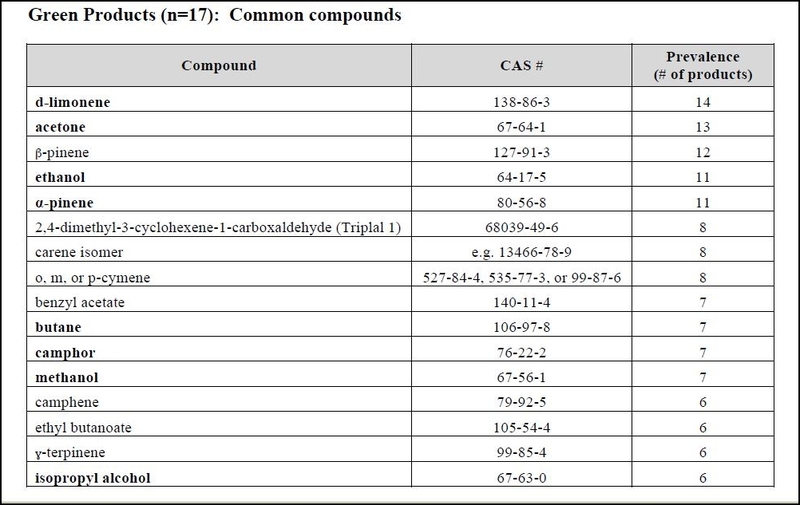 The analysis focused on individual chemicals, yet potential product toxicity depends on other factors, such as mixtures of chemicals and concentrations. – The GC/MS headspace analysis measured primary VOC emissions, directly from each product, which did not capture the generation of secondary pollutants. The disclosure of some chemicals, but not all chemicals, on product labels and MSDSs may lead consumers to presume that they are seeing all ingredients. In sum, common consumer products represent a significant but largely unregulated and understudied source of human exposure to VOCs, and thus continued research could promote awareness and efforts among agencies, industries and the public to reduce health risks and improve air quality. Volatile emissions from common consumer products. Commercial fragrance free product can have hazardous VOCs too! 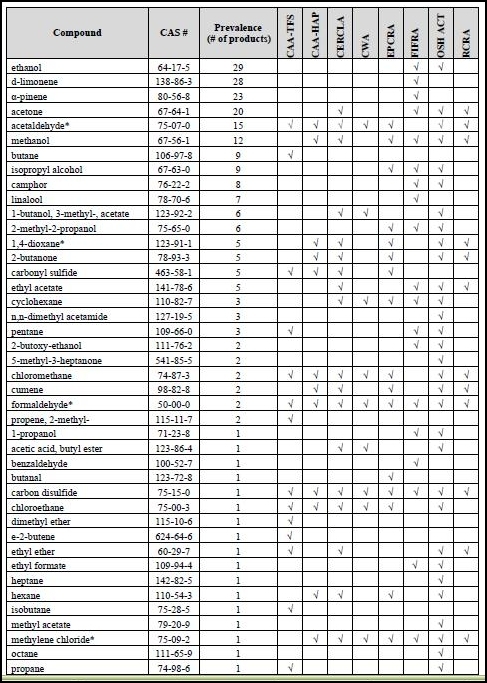 Here are the compounds found in everyday products that most of us use on a daily basis, and that are regulated as toxic or hazardous!!! Just because a brand name product is cashing in on the growing need for fragrance free products, it doesn’t mean they are doing so with safe and healthy ingredients. In some cases, they are still the better choice, but as we can see from this research, it’s not as simple anymore as grabbing something that says unscented or fragrance free. And please don’t think you will escape the effects of inhaling and absorbing these pollutants. The evidence is mounting that fragrance chemicals will be responsible for more health harm than tobacco smoke. Pediatricians and child health experts are advising fathers to be, pregnant women, and children (especially) to avoid products with fragrances in them, as well as a number of other everyday, yet toxic products. They have been slow to act, waiting too long for definitive proof. As was noted in the study, the usual advice to read labels isn’t helping to protect us. Better laws are needed, but we need to be cautious there too, as industry is continually working to write the laws (please read that article) that would serve to protect them from us, instead of laws that protect our health from their toxic waste. We are the ones who pay the costs with damaged health, chronic illness, and premature deaths, from breathing in the dirty air, and drinking polluted water (these products do go down the drain after all and there is no away). It’s time to stop this insanity and demand public health be the priority, not polluter profits! They should not be allowed to pollute us for profit while we pay the costs! Safe, non-toxic (fossil-fuel-free) products are possible and preferable! 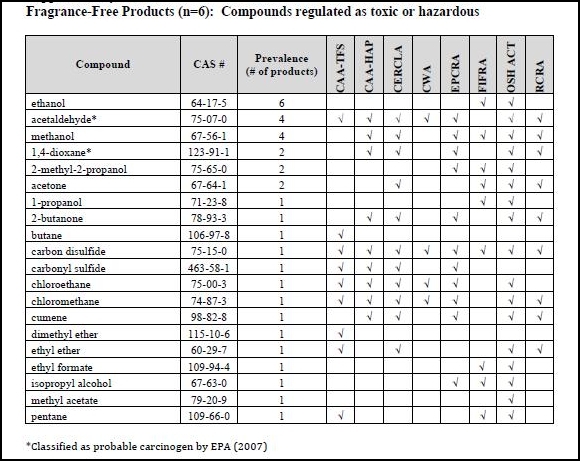 Previous research by Dr Steinemann, listed these chemicals and known health effects in laundry products and in air “fresheners“. Check out Dr Steinemann’s website for some of her past research here. “Women’s Voices for the Earth”, EWG, “Healthy Child, Healthy World”, “Safer Chemicals, Healthy Families”, “Health Care Without Harm”, “The Collaborative on Health and the Environment”, “The Silent Spring Institute”, “TEDX – The Endocrine Disruption Exchange”, and “Breast Cancer Fund” are just a few of the organizations working to help us make better decisions in the absence of proper regulations. Links to their organizations and work are scattered throughout this site and in the sidebar under resources. You can follow them on fb too, for the latest news and updates. Choose fragrance free products made by companies that divulge all of their ingredients. Also, essential oils are NOT always safe or healthy, in fact they can also contain undisclosed chemicals, react with ozone to create more harmful pollutants, and can be sensitizers. They should only be used medicinally under the care of qualified practitioners (not MLM sales reps who are inventing all kinds of questionable ways to use EOs). Clean does not smell! Use the ingredients your grandparents used, and open a window! If you or your children experience any health problems now, you may also wish to consider air and water purification systems to help remove some of these chemicals from your life. We shouldn’t have to pay for this, but we do. Until we change the laws. Let’s work together to make this world a safe and healthy place for everyone to breathe, drink, eat, and live. This entry was posted in Accessibility, Air Quality, Chemicals, Disability, Environmental Health, Fragrance, Health, Products, Research and tagged 156 VOCs, allergies, asthma, autism, cancer, Chemicals, cleaning, environmental sensitivities, EOs, essential oils, everyday products, green cleaning, hazardous air pollutants, health, indoor air quality, labels, laundry, MCS, MCS/ES, personal care, petrochemicals, toxic, toxic trespass. Bookmark the permalink. Excellent info! Thanks for taking the time to put all of this info here, some of those journal articles are really hard to get the full version of to read. It’s great to know that I can get the bulk of the recent research here instead! I know… Who has the ~ $40 or so to spend on each piece of research that could be useful to us? I wish I had access to a free research database! I used to know someone at a Uni who would find a few of the more relevant ones I asked for, but I don’t know anyone to ask now. Sometimes, you can contact the researcher (there’s usually an email addie with an abstract) and ask them. They might have non-copyrighted versions of the paper and be happy to share. This research wasn’t even picked up by the North American media except for Science Daily. Which is shocking considering the new bills now being considered to “regulate” chemicals in the US (see the article link in the post for more details about that). Dr Steinemann used to do her research in the US but I think the chemical industry drove her out. She couldn’t even quote from package labels or MSDS on this piece because it could identify the products. Don’t people realize that this is just plain wrong? We need to turn this thing around now! Thanks for putting this out there – consumers cannot be expected to protect themselves when the information is just not available to us. (And even if it were, we’d all have to become chemists.) Proper legislation that protects the people (not businesses and their profits) is the only way forward. Interesting that essential oils can contain undisclosed chemicals – how unscrupulous can businesses be? !